Are regional trade shows the answer? (BRAIN) — "How hard can it be to run a trade show?" Jim Kersten asked himself after hosting Chicago-area retailers at Interbike social events. A few years later, Kersten found out when he became show director of the resurrected CABDA show in Chicago, which has now expanded to a second event in California. Kersten and host Arleigh Greenwald discuss the merits of regional trade shows on the latest Shift Up podcast, available now. You can listen to the latest show below, or subscribe via most podcast apps or Spotify. Previous episodes can be seen at bicycleretailer.com/podcast. Kersten tells Greenwald that regional shows can be slower paced and better tailored for the needs of the region's dealers. "We try to make more of an intimate feel. We do that by not having 600 booths there," Kersten said. 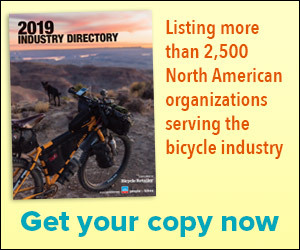 Kersten also shares some of CABDA's plans to expand following the cancellation of the 2019 Interbike Expo. CABDA West will be held at the Del Mar Speedway, near San Diego, Jan. 16-17. CABDA Midwest will be held at the Renaissance Schaumburg Convention Center & Hotel near Chicago, Feb. 13-14.